With a 24 can capacity, you might take the Tampa Bay Buccaneers Portable Party Refrigerator for a full size fridge. It's got the power wherever you need it: at home, at work, or in the car! It's got the ability to plug into a standard, or car outlet, so the party goes where you do. It's also got the vertical space for 1.5 liter bottles. 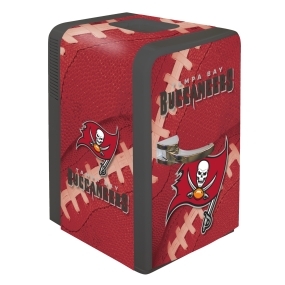 The Tampa Bay Buccaneers Portable Party Refrigerator can also be used for heating and is the ultimate gift for any fan, and makes the perfect addition to any bar, or dorm room. 12v DC/110v AC. * Ships in approximately 10 business days.